So this next book may be a shocker since I’m mostly a fiction reader but I have LOVED reading through this heart felt story! No matter what your thoughts are on her politics or her husband, I truly recommend reading this incredible woman’s story!! Born in the boom-and-bust oil town of Midland, Texas, Laura Welch grew up as an only child in a family that lost three babies to miscarriage or infant death. She vividly evokes Midland’s brash, rugged culture, her close relationship with her father, and the bonds of early friendships that sustain her to this day. For the first time, in heart-wrenching detail, she writes about the devastating high school car accident that left her friend Mike Douglas dead and about her decades of unspoken grief. With rare intimacy and candor, Laura Bush writes about joining one of America’s most prominent political families, as well as her deep longing for children and her husband’s decision to give up drinking. In 2001, she moved into the White House. She captures presidential life in the harrowing days and weeks after 9/11, when fighter-jet cover echoed through the walls and security scares sent the family to an underground shelter. It was a time that would also transform her role. One of the first U.S. officials to visit war-torn Afghanistan, she reached out to disease-stricken African nations and tirelessly advocated for women in the Middle East and dissidents in Burma. She championed programs to get kids out of gangs and to stop urban violence. In these pages, she reveals her public triumphs and personal tribulations and the story of real life inside the White House. 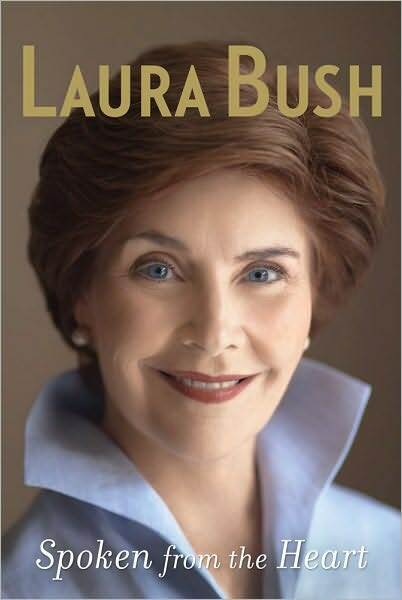 Laura Bush’s compassion, her sense of humor, her grace, and her uncommon willingness to bare her heart make this story revelatory, beautifully rendered, and unlike any other first lady’s memoir ever written. Laura Bush was the First Lady of the United States from 2001-2009. She lives in Dallas, TX with her husband, President George W. Bush, and is the mother of twin daughters, Barbara and Jenna. So as I said before I don’t normally read non-fiction books but this one was GREAT! Here are few things I learned about Laura Bush. She is a West Texas girl! I knew she was from Texas but I don’t know why I just assumed she was from Dallas or Houston. I loved her descriptions of the West Texas area and it was so great that I could actually relate:). She was late to marry, 30, and late to having her twin girls. She was a teacher for 4 years (I think) before even meeting George Bush. She and George were both from the Midland area but never dated or got to know each other until years later. She is a VERY well-educated lady whom I always thought was VERY socially aware and AMAZING and now I KNOW this all to be truth! She is a GREAT mother to her daughters and is an AMAZINGLY supportive wife to her very interesting and gentlemanly husband!! Also did you know that the President and his family are responsible for ALL expenses in the White House minus room/ board, utilities and functions. I had NO idea! Her husband (whether you agree with his politics or not) is a great man of God who is committed to doing the right thing even when it seems everyone does not agree. Here are few excepts from the book that taught me something about the world, Laura, George, or the events of their lives. I hope you enjoy and choose to pick up the book for yourself! !